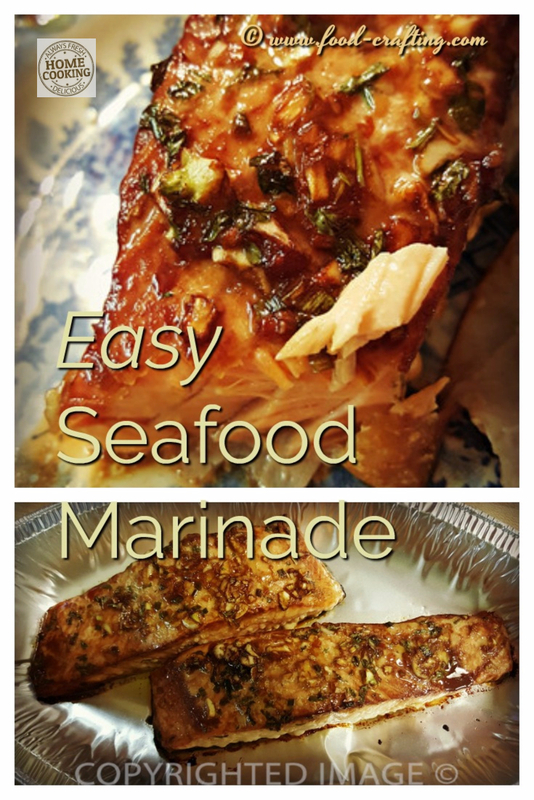 Easy seafood marinade – the kind of marinade that will make you forget all about bottled sauce. Seriously. It’s a quick seafood marinade recipe you can tweak with a variety of ingredients. Come up with a different tasting sauce for any seafood or fish fillet is on the menu. Make each recipe totally unique. In a hurry? 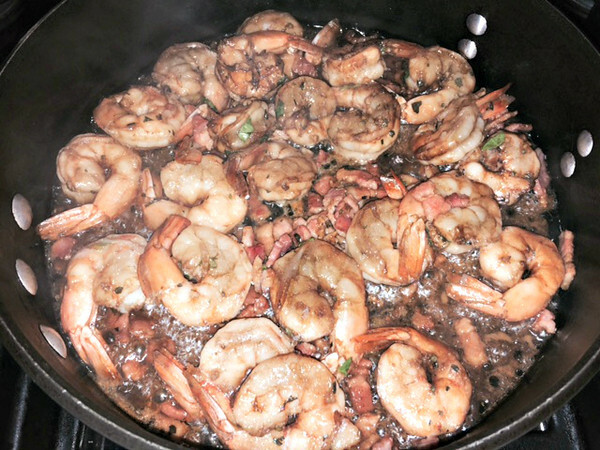 Quickly infuse flavors into seafood (and meats) using a vacuum sealed marinating container ! 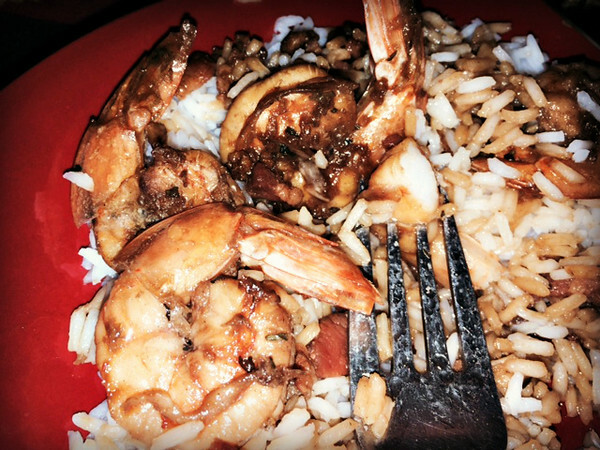 Soy and Worcestershire sauces create a tangy glaze for everything from shrimp, swordfish and salmon fillets. We love seafood and eat it often – baked, fried, and grilled. I heard about this seafood marinade through the family grapevine years ago and it finally came my way the day before yesterday. Can I add that this seafood marinade was perfectly timed to try on the salmon portions we enjoyed at dinner last night? I tweaked the marinade recipe mainly because I did not have one of the ingredients – basil. At first I thought it odd to combine Worcestershire sauce with soy sauce. I was wrong. I also found it strange that the recipe called for basil. Basil added to soy sauce? 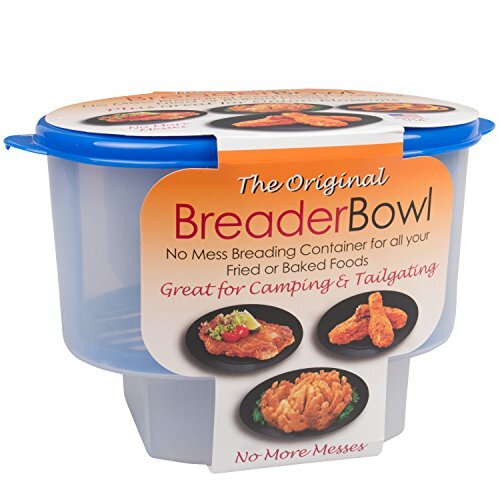 It is often a single ingredient that imparts that unique flavor twist and makes the difference between a great taste and superior seasoning. Curious about the variety of seasonings and brines for fish? The selection is incredible! And…there’s more than one way to cook your salmon . A seafood marinade with soy sauce and worchestershire sauce as the main ingredients. Yes, the sodium content is off the charts so use low sodium soy and Worchestershire sauce. Marinate the shrimp, swordfish or salmon at least for 30 minutes. Trim the fat off of the slices of thick bacon and dice. When golden but not crisp, add the seafood. Turn off the heat and pour the leftover marinade over the seafood. Serve over Basmati rice with a green salad. A friend shared this marinade recipe ions ago. I added the bacon, lemon juice and olive oil. In an oblong baking dish, whisk the soy sauce, Worcestershire sauce, lemon juice and the olive oil. Add the fresh herbs and the garlic. 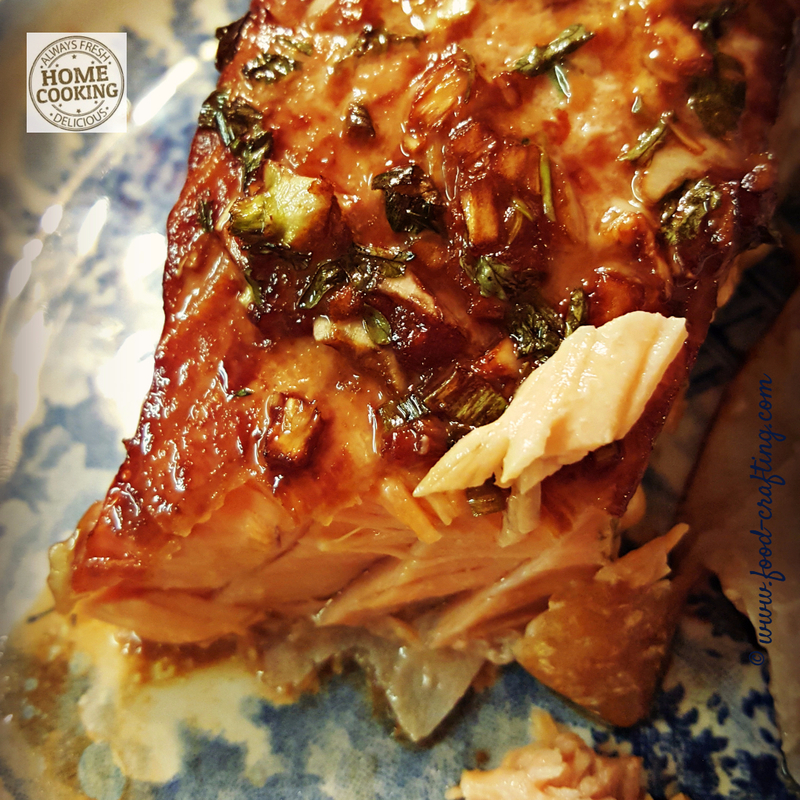 Place the salmon fillets first skin side down in the marinade, then flip them over and make sure all sides are completely coated with the marinade. 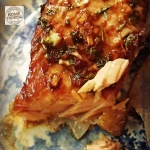 Bake the salmon in a different pan than the one in which it marinates. The fillets are thick enough that the marinade would burn and ruin your dinner in the time it takes the fish to cook through completely. Thirty minutes was perfect for these thick fillets but you have to adjust the cooking time for thinner and smaller pieces of salmon. I double checked “how to bake salmon” instructions on a home magazine website . I did not measure mine but I know it was close to 2 inches thick. Nor did I follow their cooking directions. Those cooking directions would be perfect for the small 4 to 6 oz. portions! 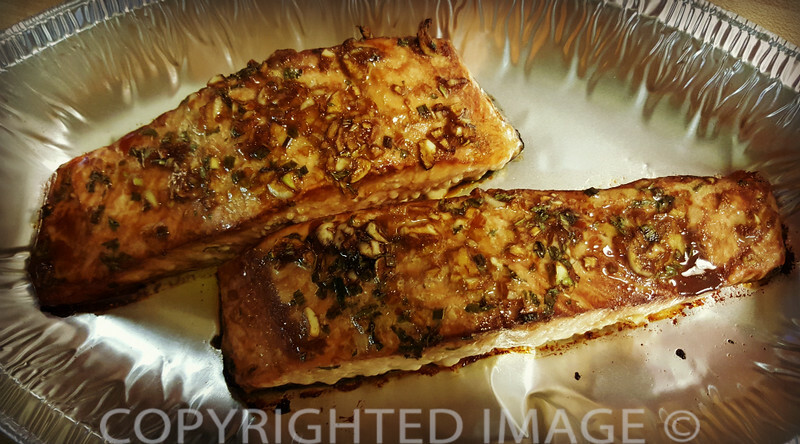 Marinate these large salmon portions for at least 1 hour. Reserve any marinade to use as a basting sauce once during the cooking period. Bake at 350 degrees for about 25 to 30 minutes in a toaster oven. If you plan this recipe for seafood marinade ahead of time, use green onions instead of chives. You can also kick it up several notches by adding red pepper flakes to the marinade. For a Chinese twist, add a few drops of sesame oil or a couple spoonfuls of potent black bean sauce.